Litchfield Park is a small, suburban community in close proximity to downtown Phoenix. A planned community, it maintains a quiet, close-knit atmosphere, and lies close to both the Estrella and White Tank mountains, and is home to the famous Wigwam Resort. Residents love that it’s a suburban community that has a small town atmosphere and causal lifestyle. One of the highlights of Litchfield Park is the Wigwam Resort Hotel. It was originally used for executives visiting Goodyear but opened to the public in 1929 to the public and has been a hit ever since. You will also find the Cricket Wireless Pavilion nearby that hosts some of the biggest concerts in Arizona and has at least 50 major shows each year. There are many beautiful homes in Litchfield Park for residents to choose from, including single family homes, town homes, condominiums, apartments, and large estates. While entertainment areas are a large part of the city, there are also many areas for shopping, dining, and outdoor recreation as well. The median home value is $217,900. The home value rate is predicted to rise by 2.0% in the coming year. 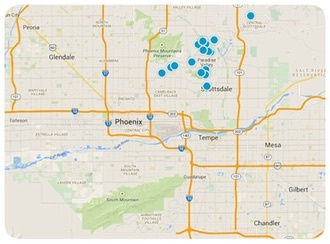 The median price per square foot is $128 and this is higher than Phoenix Metro’s median of $124. If you are looking for a new home in Arizona, consider Litchfield Park. Search our online resources to find homes for sale in the city and you will see the great value of both a home in Litchfield Park and our assistance in the process of buying it. Our website's different elements- such as MLS listings, featured properties, etc. - and our experienced REALTORS® will get you into your ideal home in almost no time! So once you have decided that you'd like to invest in Litchfield Park real estate, contact us and you will already be well on your way to owning your dream home.